Here, weâ€™ve compiled a ton of links to useful, actionable environmental websites. Feel free to suggest a websiteÂ for the list –Â or even a whole new category –Â by leaving a comment! Youâ€™ll find resources for calculating your environmental footprint and for helping you reduce your CO2 output. Weâ€™ve also got information for learning how to find local farms and markets that support local farms, where to get tax rebates for energy efficiency, how to pick organic gardening products that really work, etc. If youâ€™re interested in making changes in your life to improve the environment, youâ€™ll find something here to help you make informed, practical decisions. This page is a resource for people who want to do something to improve their environment, not just complain about it! The Energy Star website is a great resource for learning about energy efficiency and energy efficient products for the home. The Energy Star program also has a home improvement tips website. Clean Air Gardening has a great list of energy saving tips for the home. The Partnerships for Home Energy Efficiency (PHEE) runs the Energy Savers program and has lots of great info on their website. Learn how to weatherize to prevent energy leaks at this U.S. Department of Energy website. The ZIP-Code Insulation Program from the U.S. Department of Energy tells you the most economic insulation level for a new or existing house. Check out the Database of State Incentives for Renewables and Efficiency (DSIRE) for state, local, utility, and federal incentives that encourage renewable energy and energy efficiency. See this website for information on Programmable home thermostats. Find information on new refrigerators with the Energy Star label here. Buy environmentally friendly products for the home and garden at Clean Air Gardening. The Energy Star website is the ultimate place to learn about energy efficiency and energy efficient products for the home. The American Council for Energy Efficiency has a website on selecting the best energy efficient windows for your home. Hereâ€™s an EPA website about selecting windows, doors, and skylights to increase energy efficiency in the home. The Energy Star Home Energy Yardstick helps you to compare your home’s energy efficiency to other homes in the U.S. They also give you recommendations for home improvements after you use the tool. Chuck Wright Consulting has a large list of Energy Use Calculators. The U.S. Department of Energy has a number of energy calculators and software to help you calculate your home energy use. The Refrigerator Retirement Savings Calculator tells you how much money youâ€™d save if you switch to a new, energy efficient refrigerator. Find out home much energy you use heating water for your faucet and showerhead at the â€œEnergy Cost Calculator for Faucets and Showerheads.â€ It is provided by the Federal Energy Management Program. Here are some cost estimators for different space heating and cooling systems. EarthToys.com is an online resource for those interested in alternative energy and alternative fuels technologies. The U.S. Department of Energy has a website with lots of information on selecting Hybrid electric vehicles (HEVs). Check out the U.S. Governmentâ€™s National Renewable Energy Laboratory website for information about recent renewable energy innovations and research. “Biomass as Feedstock for a Bioenergy and Bioproducts Industry” is a PDF file of a 2005 joint study sponsored by the United States Department of Energy and Department of Agriculture. ColoradoEnergy.org has an interesting website called the Energy Action Guide, with lots of tips about switching to alternative sources of energy. Tips for selecting heating fuel and system types from the EPA. 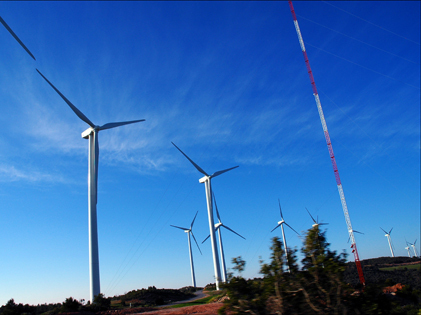 The EPA has a list of resources about small wind electric systems for the home. Tips for making solar energy more affordable for the average citizen from Mother Earth News. This U.S. Department of Energy website has lots of information on solar energy. The North Carolina State University Solar Center website has a huge list of solar energy links to check out. An interesting site from the California Solar Center about the history of heating water with solar energy. Hereâ€™s the website from the U.S. Department of Energy’s Office of Energy Efficiency and Renewable Energy Solar Energy Technologies program. The EPA has an excellent website about Passive Solar Home Design. Hereâ€™s the American Solar Energy Association website. The Solar Energy Industries Association (SEIA) is a trade association representing solar energy manufacturers, dealers, distributors, contractors, installers, architects, consultants, and marketers. Hereâ€™s an Office of Energy Efficiency and Renewable Energy (EERE) website about financial assistance opportunities for new renewable energy and energy efficiency technologies. The Energy Star website has information on Federal Tax Credit incentives for Energy Efficiency in the home. See this U.S. Department of Energy website for more information about solar energy. Jetson Green is a Blog all about green building architecture and projects. Calfinder.com has a Green Remodeling Blog that will get you going withÂ your nextÂ remodeling project. Hereâ€™s the website for the governmentâ€™s LEED (Leadership in Energy and Environmental Design) program. Hereâ€™s an EPA website about designing and remodeling to create and energy efficient home. A list of green roof standards from the ASTM. A list of German green roof standards. GreenRoofs.com is a â€œGreen Roof Industry Portal.â€ Their words not mine. Green Roofs for Healthy Cities is â€œYour Green Roof Industry Infrastructure Association.â€ Again, in their words, not mine. Hereâ€™s a list of design guidelines for green roofs from a Canadian website (PDF file). The Michigan Water Efficiency Program has a great PDF file with lots of information on saving water in the home. Calculate how much water youâ€™re losing due to leaks at this American Water Works Association calculator. The U.S. Environmental Protection Agency has information regarding water efficiency in the home. The Alliance to Save Energy provides information on water conservation for hotels. The American Water Works Association has lots of information on reducing water use. â€œFlex Your Powerâ€ is an organization with a great site that has helpful information about energy-saving low flow showerheads and faucet aerators. The Colorado State University Extension Service has a website on the benefits of setting up a drip irrigation system in your garden. Texas A&M has a site about basic Xeriscaping principles. This website managed by our very own Lars has a list of ways to reduce your water use in the bathroom. There are lots of reasons to buy from CSA (Community Supported Agriculture) projects. By buying local produce from small farmers, you can help to reduce the amount of energy used to transport our food long distances. You can also help protect arable land from development. To learn more about buying local produce, the USDA has a great website all about Community Supported Agriculture. They list some of the following resources and others to help you locate local farms. NewFarm is a website that has a resource that allows you to find a local farm. It doubles as a search engine to help restaurants, retail stores, and businesses interested in purchasing produce from local farms find farms to buy from. The Biodynamic Farming and Gardening Association has CSA listings to help you find local farms. Local Harvest has a tool to help you find a CSA project within your zip code. Wilson College has an extensive CSA Farm Database. The Eat Well Guide gives you a listing of farms, stores, and restaurants that offer meat, poultry, dairy, and eggs in the United States and Canada that have been raised in a sustainable way. The National Sustainable Agriculture Information Service (ATTRA) has a website that lets you search a database of locally produced foods. The U.S. Forest Service has a great page about the benefits of planting trees in your area. Check out this excellent guide about the benefits of garden compost. Hereâ€™s an EPA website about increasing home energy efficiency with home landscaping. The Arbor Day Foundation has some excellent community tree planting programs you can check out. Clean Air Gardening has an article about the benefits of planting trees. Organic Gardening Tips is a website with lots of information for those looking to go organic. Mostly Organic Gardening is a website with information for gardeners whoâ€™d like to try out a few organic techniques to see how they work. Hereâ€™s an interesting article by the Christian Science Monitor all about the environmental benefits of using traditional reel mowers instead of gas mowers. The US Environmental Protection Agency has an excellent program that encourages the use of native plants for home landscaping called Greenacres. A great site on city farms and urban agriculture. Green Learningâ€™s tips for eco-friendly travel and ways to cut your carbon emissions when you travel. Planetaâ€™s Sustainable Travel Website has tons of information for those looking for environmentally and culturally responsible travel. Tufts University Environmentally-Friendly Travel Tips. I noticed that there is not much information about the effect of waste on climate change. Man had been disposing waste and many waste companies as well as people who wanted to reduce waste in landfill are creating more problem in their alternative methods. More energy and less efficiency systems are used though there are others that are more effective. This is because, such waste companies need waste to survive and without it, they will have to close down. As a result, alternative methods that achieve zero waste are not promoted and used by such companies, including local government.